SIERRA ODC Private Limited, a Software/IT solutions company located in Southern India is glad to announce its participation in GITEX 2015, for the 8th consecutive year. 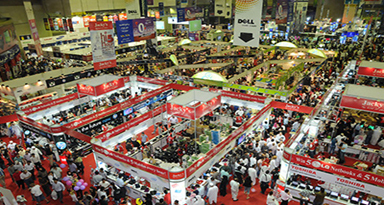 The GITEX event is scheduled to be held at the Dubai World Trade Centre, Hall: Sheikh Rashid Hall, Stand: SR-E1, Dubai, UAE from 18th – 22nd October 2015. SIERRA's focus in this year's participation is to promote its flagship product eFACiLiTY® – Enterprise Facility Management Software (CAFM software), a contemporary solution that automates entire operations like Asset Management, Property Management, Maintenance Management, Visitor Management, Facility Booking, Space Management, Tenant Billing, Resource Management, Roster Management, Travel Request Management and Mail Room (Consignment) Management in an organization / facility. eFACiLiTY® is a globally recognized CAFM/EAM/CMMS software which also has a large clientele base in the Middle East and Africa. SIERRA has successfully implemented eFACiLiTY® for many International Clients that include Dubai Airports, Ministry of Health-Bahrain, Ministry of Health-Kuwait, The Putrajaya City-Malaysian Government's ministerial offices, Malaysian Communications and Multimedia Commission (MCMC), British Aerospace Systems-Saudi Arabia, L&T-UAE (Haramain High Speed Rail project), Galfar Engineering & Contracting-Oman, Nigerian Petroleum Development Company (NPDC), Enterprise Bank, Savvy Capire-Nigeria, Fatimah Hospital, St. Regis (6 star hotel)-Malaysia, Boulevard Mall (Salmiya Park)-Kuwait, TRANE-Singapore, Telbru-Brunei, Four Points Sheraton-Darling Harbor-Australia. SIERRA is also an expert in implementing Automated Warehouse Management Systems (WMS) integrated with Automated Storage & Retrieval Systems (ASRS). SIERRA has implemented various WMS integrated with ASRS projects in Asia primarily with clients like the world's largest 2-wheeler company, Federal Governments's Currency Notes Printing Press, Army/Navy etc. SIERRA is keen to provide similar solutions to the Middle East markets in the industry segments including Warehousing & Distribution, Manufacturing, Aerospace, Government, Automotive, Food & Beverages, Meat Processing and Chemical/Pharmaceutical sectors in the Middle East. As the crowd migration from rural to urban is increasing, the concept of Smart Citys is emerging as a hot topic in recent days. A Smart City is characterized by infrastructure that are user friendly, hassle free, energy efficient and smart, that benefits the Government, Business, Citizens and the Environment. SIERRA's eFACiLiTY® automates and controls all the facility operations which render a complete solution for the Smart Buildings through the integration of BMS/BAS systems. Through this trade show, SIERRA is looking for new opportunities in Software Development Outsourcing and also looking for Partners and Resellers for eFACiLiTY® in the thriving Middle East, North African and South Asian (MENASA) markets. SIERRA invites you to join us at GITEX 2015. We are reachable at Sheikh Rashid Hall Stand: SR-E1 and will be represented by our CEO & Managing Director, Mr. Giridhar; Head – Client Services, Mr. David Raja P; Head – Global Sales, Mr. Girish Krishnan. Please register here for free complimentary passes! !